In 2015, the first long barrow in thousands of years, inspired by those built in the Neolithic Period, was built near All Cannings in England. The project was instigated by Tim Daw, a local farmer and steward of Stonehenge. 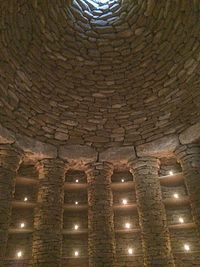 The barrow was designed to have a large number of private niches within the stone and earth structure to receive cremation urns. The structure received significant media attention, with national press writing extensively about the revival of the structures, and various episodes of filming, for example by BBC Countryfile as it was being built. It was fully subscribed within eighteen months. This was followed soon after by a new barrow near St Neots. Further plans to revive barrows are in development in Herefordshire and at Soulton in Shropshire. There are over 40,000 tumuli in the Great Hungarian Plain, the highest is Gödény-halom near the settlement of Békésszentandrás, in Békés county. Sírhalom origins and forms are diverse: tells, graves, border barrows, watcher barrows. In the United Kingdom, barrows of a wide range of types were in widespread use for burying the dead from the late Neolithic until the end of the Bronze Age, 2900-800 BC. Square barrows were occasionally used in the Iron Age (800 BC-43 AD) in the east of England. 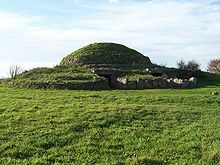 The traditional round barrow experienced a brief resurgence following the Anglo-Saxon conquests, with the introduction of northern Germanic burial practices from continental Europe. These later barrows were often built near older Bronze Age barrows. They included a few instances of ship burial. Barrow burial fell out of use during the 7th century as a result of the spread of Christianity. Early scholarly investigation of tumuli and theorising as to their origins was undertaken from the 17th century by antiquaries, notably John Aubrey, and William Stukeley. During the 19th century in England the excavation of tumuli was a popular pastime amongst the educated and wealthy upper classes, who became known as "barrow-diggers". This leisure activity played a key role in laying the foundations for the scientific study of the past in Britain but also resulted in untold damage to the sites. 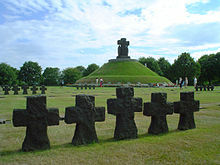 During the early Middle Ages, Slavic tribesmen inhabiting what is now the Czech Republic used to bury their dead under barrows. This practice has been widespread in southern and eastern Bohemia and some neighbouring regions, like Upper Austria and Lusatia, which at that time have been also populated with Slavic people. There are no known Slavic barrows in the central part of the country (around Prague), nor are they found in Moravia. 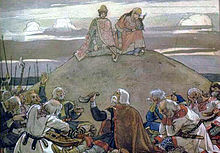 This has led some of the archaeologists to speculations about at least three distinct waves of Slavic settlers, who colonized Czech lands separately from each other, each wave bringing its customs with it (including burial rituals). At places where barrows have been constructed, they are usually found in groups (10 to 100 together), often forming several clearly distinct lines going from the west to the east. Only a few of them have been studied scientifically so far; in them, both burials by fire (with burnt ashes) and unburned skeletons have been found, even on the same site. It seems that builders of the barrows have at some time switched from burials by fire to burying of unburned corpses; the reason for such change is unknown. The barrows date too far back in history (700 AD to 800 AD) to contain any Christian influences. The Bussy-le-Château commune (Marne) has five Roman, Visigoth and Burgundian tumuli: three of them remain relatively intact along the Noblette river [fr]. A few kilometers from Carnac are the 140 by 20 metres (459 ft × 66 ft) neolithic Er-Grah tumuli [fr] near the famous broken Menhir. The five Tumulus de champ Châlons [fr] in the Benon forest form a neolithic necropolis in the Courçon commune (Charente-Maritime). 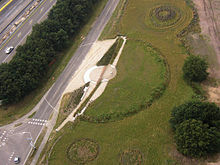 Dissignac tumulus [fr] is a neolithic monument located about 5 kilometres west of Saint-Nazaire (Loire-Atlantique). Péré Tumulus [fr] on Prissé-la-Charrière commune (Deux-Sèvres): a neolithic long barrow with tumulus 100 by 20 metres (328 ft × 66 ft), dating from 4,450 to 4,000 BC. Saint-Fiacre tumulus [fr], on the Melrand commune (Morbihan), is listed as monument historique since 1972. 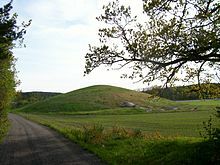 Gamla Uppsala, The Royal mounds (Swedish: Kungshögarna) is the name for the three large barrows which are located in Gamla Uppsala. According to ancient mythology and folklore, it would be the three gods Thor, Odin and Freyr lying in Kungshögarna or Uppsala högar. 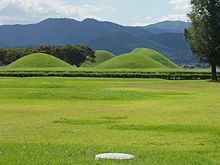 In Japan, powerful leaders built tumuli known as kofun. The Kofun period of Japanese history takes its name from these burial mounds. The largest is Daisen-ryo Kofun, or more commonly Nintoku-ryo Kofun, with a length of 840 metres. 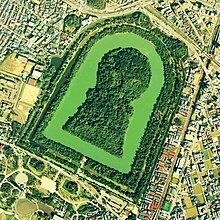 In addition to other shapes, kofun include a keyhole shape, typically seen in Daisen Kofun. Foreign museums possesses some grave goods. Taber Hill is a Haudenosaunee burial mound in Toronto, Ontario. Mound building was a central feature of the public architecture of many Native American and Mesoamerican cultures from Chile to Minnesota. 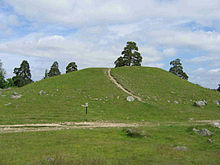 Thousands of mounds in the United States have been destroyed as a result of farming, pot-hunting, amateur and professional archaeology, road-building and construction. Surviving mounds are still found in river valleys, especially along the Mississippi, Tennessee and Ohio Rivers, and as far west as Spiro Mounds in Oklahoma. ^ Calvert Watkins, American Heritage Dictionary of Indo-European Roots, 2000, p. 92. ^ Frederick Klaeber, Attila's and Beowulf's funeral, PMLA (1927); Martin Puhvel, The Ride around Beowulf's Barrow, Folklore (1983). ^ "500". The Telegraph. Retrieved 2017-12-10. ^ Makey, Julian (2016-10-23). "First burial barrow in thousands of years is completed at Hail Weston". cambridgenews. Retrieved 2017-12-10. ^ www.stmem.com, Shropshire Tourism -. "New Barrow | Soulton Hall". 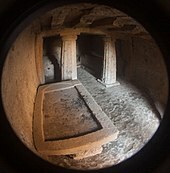 www.soultonhall.co.uk. Retrieved 2017-12-10. ^ Proceedings of the Royal Geographical Society of London. Royal Geographical Society of London. 1881. p. 571. Retrieved 18 October 2014. ^ Goran Majetić (July 9, 2008). "Tumulusi u Hrvatskoj - veličanstvene prapovijesne "piramide"" (in Croatian). udruga-kameleon.ht. Archived from the original on 13 May 2010. Retrieved 8 October 2010. 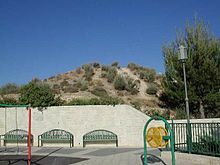 ^ "Picture of "Gödény-halom"". Archived from the original on December 11, 2008. ^ "Kiss Csaba: A kunhalmok védelme és meghmentésük lehetőségei. A Puszta 1999/1 pp 240-287" (PDF). ^ Prof. dr Ljubisa Folic. "Crucified Heritage". kosovo.net. Retrieved 8 October 2010. ^ BEd, Herbert KALSER. "Pettendorf > Kulturdenkmäler". Hausleiten (in German). Retrieved 2018-07-15. 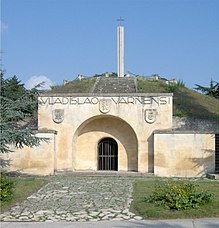 ^ "Die hallstattzeitlichen Hügelgräber von Langenlebarn, Niederösterreich (FÖMat A 12)" (in German). Retrieved 2018-07-15. ^ "Österreichische Nationalbibliothek - Deutsch Altenburg". www.bildarchivaustria.at. Retrieved 2018-07-15. ^ "Die Hügelgräber - Schandorf". schandorf.at (in German). Retrieved 2018-07-15. ^ Koerbler. "Marktgemeinde Großklein: Die Fürstengräber von Kleinklein". www.grossklein.gv.at (in German). Retrieved 2018-07-15. ^ P.-H. Letaudin (1869). Etude historique sur La Cheppe, le camp d'Attila, et ses environs (in French). Le Roy. pp. 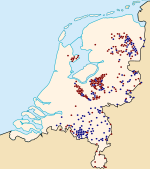 5–. Retrieved 27 April 2013. ^ Inge Adriansen. Nationale symboler i det Danske Rige, 1830-2000, Vol. 2, 2003, p. 123. ISBN 978-87-7289-794-3. ^ "Fredede Fortidsminder" (in Danish). Danish Agency for Culture. 28 January 2015. Archived from the original on 21 August 2014. Retrieved 2 September 2015. ^ "gravhøj | Gyldendal - Den Store Danske". www.denstoredanske.dk (in Danish). Retrieved 2017-12-10. ^ "Tusinder af gravhøje | Gyldendal - Den Store Danske". www.denstoredanske.dk (in Danish). Retrieved 2017-12-10. ^ "Professor: Vi risikerer, at gravplyndrere røver hele vores historie". DR (in Danish). Retrieved 2017-12-10. ^ 前橋市教育委員会 (2016-02-29). "赤城山南麓の古墳". Comprehensive Database of Archaeological Site Reports in Japan. Retrieved 2016-09-02. ^ Nelson, Sarah M. (1993-05-13). The Archaeology of Korea. Cambridge University Press. ISBN 9780521407830. ^ (Manitoba History) The Manitoba Mound Builders: The Making of an Archaeological Myth, 1857-1900. Gwen Rempel. 1994. Retrieved 6 February 2017. ^ History of Archaeology, Encyclopedia of Saskatchewan. Retrieved 6 February 2017. 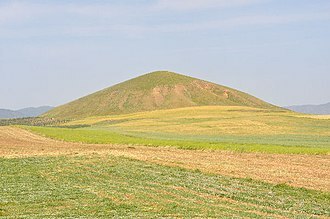 "Tumulus" . Encyclopædia Britannica (11th ed.). 1911.